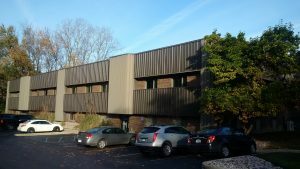 Looking For an Office Building With a Great Price? One East is an office condominium development on East Lansing Drive, just off Merritt and South of M-78 in the City of East Lansing. This main floor unit in Ingham County features reception area, two offices and atrium views. Unit is very efficient and building common bathrooms are located just down the hall, it has high speed internet, and is categorized as a professional office. The suite is easily accessible from the main floor entry for barrier free access. Contact Shannon Summersett to schedule your private viewing at 517-575-9494 or view the full listing here.